James E. Bina, Ph.D. Richard E. Lee, Ph.D. Phillip D. Rogers, Pharm.D., Ph.D. Charles Ryan Yates, Pharm.D., Ph.D. Currently used treatment strategies for tuberculosis (TB) involve administration of multiple drug combinations for a minimum of 6-9 months. However, these prolonged regimens do not always achieve sterilization, as evidenced by post-therapy relapse in a subgroup of treated individuals. 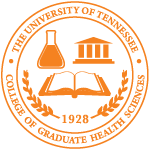 In an effort to develop novel therapeutic agents for TB a new class of chemical agents, nitrofuranylamides, is being developed at the University of Tennessee Health Science Center. We hypothesized that the application of an iterative pharmacokinetics and pharmacodynamics (PK/PD) guided approach would facilitate the optimization of nitrofuranylamide lead compounds suitable for further development. First, we examined the biopharmaceutic properties and preclinical PK of nitrofuranylamide lead compounds. The first tested lead compound, Lee 562, exhibited a high systemic clearance, short terminal half-life, and low oral bioavailability of 15.9%. These observations were further supported by the poor metabolic stability of Lee 562. Thus, two second generation follow-up compounds, Lee 878 and Lee 952 were tested that included structural modifications for increased metabolic stability. Both compounds showed improved metabolic stability compared to Lee 562. As expected, this in vitro observation translated into an increased in vivo stability (lower plasma clearance) of Lee 878 compared to Lee 562 and Lee 952, with a 20- and 10-fold higher systemic exposure, respectively. As a consequence, oral bioavailability of Lee 878 reached ~27% compared to 16% for Lee 952 and Lee 562. We then tested a new set of nine third generation compounds for microsomal metabolic stability to guide selection of a stable compound with even higher oral bioavailability. From this panel Lee 1106 was selected for further PK evaluation in rats. Lee 1106 exhibited favorable PK properties such as a low systemic clearance and a long terminal half-life. However, oral bioavailability of Lee 1106 was poor (4.6%). Biopharmaceutic evaluation of the compound showed that the compound has poor aqueous solubility and a high clogP. Further, the plasma protein binding of the compound was found to be high underlining the hydrophobicity of the molecule. Based on these results, a PK guided screening paradigm was developed for optimization of the nitrofuranylamide lead compounds. In order to add pharmacodynamic considerations to the lead optimization approach, we developed a novel in vitro PK/PD model and validated the model by studying the activity of a first line anti-TB drug, isoniazid (INH) against M. bovis BCG as a model organism. M. bovis BCG in the model was treated with multiple doses of INH mimicking concentration-time profiles encountered during multiple dosing in vivo. The time-kill data was analyzed using a semi-mechanistic PK/PD model that included an adaptive IC50 function for explaining the re-growth of bacteria observed over the course of treatment. The PK/PD model was able to describe the data well. The PK/PD index AUC0-24/MIC was found to be the most explanatory of antimicrobial effect of INH. These findings are in agreement with the previously published studies and suggest that the in vitro PK/PD model can be used for assessing the antimycobacterial activity of lead compounds. Thus, the in vitro PK/PD model was subsequently applied to establish time-kill curves for dosing regimens of lead compound Lee 1106. Lee 1106 showed exposure-dependent killing of M. bovis BCG. A semi-mechanistic PK/PD model was developed to describe the Lee 1106 mediated killing of bacteria. The model was subsequently used for numerical simulation experiments to predict the killing effect of different untested multiple dose regimens of Lee 1106 in mice. It was found that the once daily regimen is most adequate for further studies in the mouse model of TB. The information gained from the PK/PD evaluation and the simulation experiments illustrate the utility of the PK/PD guided approach for the selection of compounds with favorable properties for a high likelihood of in vivo efficacy. In summary, we have successfully developed an iterative PK/PD guided process for lead optimization of nitrofuranylamides that uses a set of biopharmaceutic, pharmacokinetic and pharmacodynamic evaluations as criteria for compound and dose selection to move to subsequent development levels. Budha, Nageshwar Rao , "A Pharmacokinetics and Pharmacodynamics (PK/PD) Guided Approach to Lead Optimization of Nitrofuranylamide Anti-Tuberculosis Agents" (2009). Theses and Dissertations (ETD). Paper 329. http://dx.doi.org/10.21007/etd.cghs.2009.0039.